Well, I can't possibly stay on my diet now. As I was mixing up a Slim-Fast shake this afternoon, I smelled something like burning rubber. The odor penetrated my nose and activated the appropriate brain cells so that I realized what was happening at almost the same instant the blender quit working. I drank what I could, avoiding the remaining clumps of wet, pasty powder, but it's obvious I can't possibly stay on my diet now. It worked, I think. Or at any rate I got what I wanted out of it. I feel less lumpy than I did, and I proved to myself that I can get through the day without constantly foraging in the kitchen. I've also managed to walk almost every day, even these cold ones, and that's helped, too. Now if I can eat one or two small meals during the day — a bowl of cereal, a sandwich — and one decent meal, I can maintain whatever ground I've gained. It's all discipline, denial and determination. I really overdid the dramatics yesterday. Not here, because I was recording exactly what I felt and did. But I've had a scratchy throat all day today, and I'm sure it's a result of my screaming fit. And then last night, when the power went out for about five seconds (in the middle of Angel) (resetting all the electronic clocks back to some default time, 12:00 in some but not all cases), I hurled a stack of magazines across the room. This morning I picked them up and put them in the recycling bag, unread for the most part. Today I've been under control, even when the blender blew up. I don't know what's made the difference. I slept about the same amount, and just as badly, as ever. Maybe I was just worn down by my own frenzied overreaction to the accumulation of small slights and petty perturbations. What seemed yesterday like a last straw seemed like nothing more than a straw today. I don't think I have the energy to throw anything. And I know for sure I don't have enough voice left to scream. 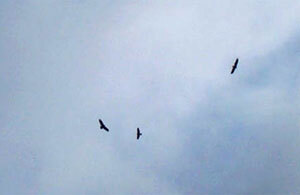 The hawks were out patrolling today, but they were joined (and outnumbered) by a squadron of buzzards. When I came back from the post office, many of them were in the road near my driveway, cleaning up an opossum that had been struck earlier. 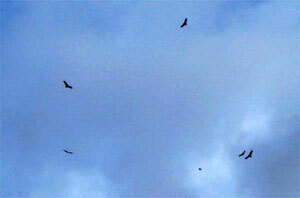 A while later they were overhead, sweeping and soaring. 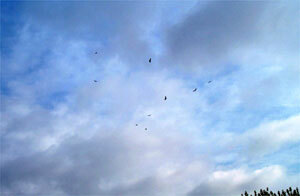 And then they moved beyond the trees to the south of my yard and circled that area for the longest time. There must have been at least 25 of them in the sky at the same time, flying independently, or so it seemed, but in similar patterns, giving the whole exhibition the feeling of an aerial display that was slightly disorganized, as if still in the early rehearsal stage. I've been patient, I think, waiting for one Republican spokesperson somewhere to come up with an argument that convinces me that hand counting the disputed ballots is not a fair way to determine the will of the voters. 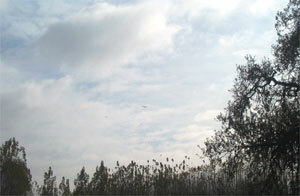 Really, my mind is open, but it seems that they are defending an indefensible position. I don't buy the argument that hand counting is somehow biased, or that the machines are more accurate. I think the process is under too much scrutiny to allow for any tampering. They say the more the ballots are handled, the more likely the "hanging chads" are to fall off, and I say so what? The voter didn't intend to leave a hanging chad, but rather to punch a hole next to the candidate's name. What does it matter if it falls off in the voting booth or during the counting process? Every argument they've given has been a self-serving attempt to preserve the narrow margin they're clinging to, and prevent the counting of any votes that might threaten that lead. For the first time tonight, I heard one of them say that it was the voter's responsibility to clean up the ballot before turning it in, and to make sure all holes are fully punched. Really? Is that clearly spelled out in the instructions? I'm all for people taking responsibility to follow the rules, even if it's clear what they intended to do. I wouldn't expect a candidate with something to lose to be gracious and accept that obvious intent, and forgive the inability to pick off all the tiny pieces hanging off the back of the card. If they can't follow the rules to the letter, they don't get to vote. Right? Is it possible to disregard party affiliations and vested interests and accept the good intentions of everyone involved? The fact that these intentions are informed by those affiliations and interests doesn't prove that there is evil behind them. Prejudice isn't evil; it's a normal, natural part of how we view the world and put our personal stamp on it. Our prejudices seem reasonable to us, until we're convinced otherwise, by reason, experience or argument. I don't impugn the motives of anyone involved in the process. But I applaud the efforts of those I agree with to thwart those I don't agree with. That's my prejudice. At some point this will all be over. Many of us won't like the outcome. Some of us will feel cheated. That's when we'll need leadership, and I suspect both candidates, and many others in public life, will be tested. Other recent recommendations can be found on the links page. Subscribe to the list to be notified of updates.